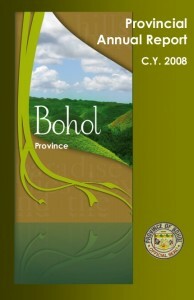 This report highlights the accomplishments of the Provincial Government of Bohol over the past year, CY 2008, and it is with pride to note the significant strides made by the individual departments, offices, hospitals and satellite units of the Provincial Government, and by the collective bureaucracy as a whole. It is noteworthy that many National Government Agencies (NGAs), non-government organizations (NGOs), academic institutions, Civil Society Organizations (CSOs), and people’s organizations (POs) feature prominently in this report. This is because our theme of Building Alliances continues to be lived, not just observed. In other words, we walk the talk. It might even be apt to say that, at this stage of collaboration and partnership among these development stakeholders, there are no visible boundaries anymore. And this spirit of dynamic collaboration, consultation and partnership will only continue to flourish. This year, we are embarking on the Provincial Development and Physical Framework Plan (PDPFP) 2010-2015, which will be crafted through a participatory, consultative, collaborative process, with virtually all sectors and stakeholders of development invited to participate. Our accomplishments speak for themselves. 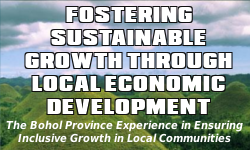 Let this Annual Report be a testament to the growing synergy between and among Bohol’s development stakeholders, with the Provincial Government at the forefront.